There’s a common saying at The University of Alabama that no matter where you are, there’s always another Alabama graduate in a crowd—someone to make you feel at home. The University has built a name for itself for nearly two centuries in terms of research and excellence; UA expands the minds of students, and by doing so, sets them up for success. When a student sets foot on campus, their future is largely unknown. But by the time they graduate from the University, they are on the path to achievement. You can see it across the country, as UA alumni are in various leadership positions in almost every profession, improving their communities and the world around them. And some alumni are leading some of the world’s top corporations, having a profound impact on thousands of people. Spanning from the arts to science, from aerospace to the oil and gas industry, UA graduates have risen through the ranks and are at the helm of major multinational corporations. They are leaders; they are negotiators; they are some of the world’s most powerful strategists. They are University of Alabama alumni. For Lockheed Martin president and CEO Marillyn Hewson, a strong work ethic and desire to serve came naturally—it was in her blood. Hewson, a Junction City, Kansas, native, grew up with a father who was a civilian Army employee and a mother who was a nurse for the Women’s Army Corps. Hewson started working at age 16 to help pay for school. When the time came to go to college, she said she chose Alabama because it was close to her family, who lived in Alabama by then. The University was also a natural fit for where she hoped her future would lead. She graduated in 1977 with a bachelor’s degree in economics, and then enrolled in graduate school at UA, where she got her master’s in economics in 1979. UA taught Hewson tenacity, a skill she uses daily as the president and CEO of Lockheed Martin, the world’s largest defense contractor. The company develops and provides defense technologies, aero- space innovations, security and advanced technologies across the globe. In 2015, Hewson was named the 20th most powerful woman in the world by Forbes. Since graduating from Alabama, she has worked for Lockheed Martin for more than 30 years, and also worked at the Bureau of Labor Statistics as an economist in Washington, D.C. before that. Today, Hewson is responsible for more than 97,000 employees at Lockheed Martin. She travels the world to meet with different facets of her company and works with the U.S. government to provide state-of-the-art technologies to better serve the country. Hewson also continues to give back to The University of Alabama. In September, Hewson donated $5 million to the Culverhouse College of Commerce and Business Administration, providing future students the resources they will need to succeed in the ever-changing business world. Occidental Petroleum CEO Vicki Hollub grew up an Alabama football fan. As a young girl, the Bessemer, Alabama, native knew that if she went to college, she would go to The University of Alabama—there was no question. And so, her parents scraped together every penny they could for her to go to school. Humbled and grateful for their sacrifices, Hollub was determined to do whatever it took to make the most of the opportunity. While at the Capstone, Hollub was a member of the Million Dollar marching and concert bands. During her junior and senior years at Alabama, she joined Tau Beta Pi and Sigma Gamma Epsilon honor societies, and the Society of Petroleum Engineers. Hollub graduated from UA in 1981, majoring in mineral engineering with a petroleum focus. When she graduated from the Capstone, her goal was to be the best engineer she could, thanks to her training at the University. For more than 30 years, Hollub has worked for Occidental Petroleum, a multinational oil and gas exploration and production company with operations in the U.S., Middle East and Latin America. The Texas-based company is one of the biggest producers of American oil in the region, with more than half of its resources coming from the United States. When Hollub became CEO in 2016, she was the first female CEO of an American oil company. But it was a slow process to get where she is now. For 14 years, Hollub worked within Oxy as an engineer before she was given her first leadership position, which opened doors, and in 2011 she was promoted to president and general manager of Oxy’s largest business unit. From there she was promoted to a vice president position, managing multiple business opportunities. Growing up in Fyffe, Alabama, Shell Oil’s U.S. Country Chair and President Bruce Culpepper was always curious about businesses and organiza- tions, and how they worked. When it came time to go to college, The University of Alabama’s Col- lege of Commerce and Business Administration was a natural fit. Culpepper had set his sights set on becoming a certified public accountant because of UA’s award-winning program. At the time, Account- ing at UA was one of the first of 13 programs in the nation to achieve separate accreditation in accounting. But just more than two years into his degree, he realized being a CPA wasn’t his calling and instead turned to human resources. Then-chair of the human resources depart- ment, Dr. Lena Pruitt, convinced him that going into the HR field would open many doors in the future. It was then that Culpepper said he found himself. Culpepper graduated from the University in 1981. Despite the change in plans, he thrived in his new field and landed a job at Shell Oil, where he has been for more than 35 years. In 2016 he was promoted to U.S. country chair and president of the company, which is among the largest oil companies in the world, with 22,000 employees in the U.S.
“I credit the University for making it possible to interview with a number of organizations just before I graduated,” Culpepper said. It was The University of Alabama that helped steer him to where he is today, Culpepper said. It’s a path that differs for every UA alum, but for people like Culpepper, Hewson and Hollub, it’s a path that has led to corporate success. 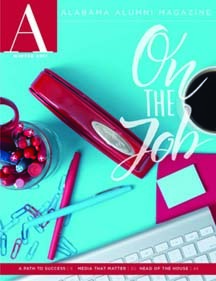 To receive four issues of the Alabama Alumni Magazine each year, join the Alabama Alumni Association Online.